Beans: Sidama Union Heirloom, Heirloom, Natural, Sidama, Ethiopia, Africa. Shop: Out of the Grey, Webshop, Pennsylvania, USA. Out of the Grey – Sidama Union Heirloom: Background information. Ethiopia is famous for the coffee it produces and one of its well known regions is Sidama. Sidama is located in the south of Ethiopia and harbours thousands of farmers who all produce coffee. In 2001 Sidama Coffee Farmers Cooperative Union (SCFCU) was founded to represent coffee producing cooperatives located throughout the Sidama zone. Today this union represents a staggering 76.000 small-scale farmers and 51 cooperatives, making it the seconds largest union in Ethiopia. Out of the Grey chose this coffee because it believes in this union of farmers. The farmers that produced this Sidama Union Heirloom have a guaranteed 100% organic label, which is a must-have label for Out of the Grey to even consider selling the coffee. 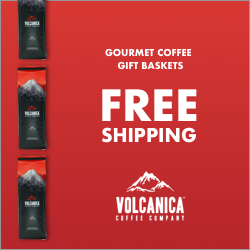 This coffee is a natural processed coffee and was harvested at an altitude between 1700 and 1950 meters above sea level. 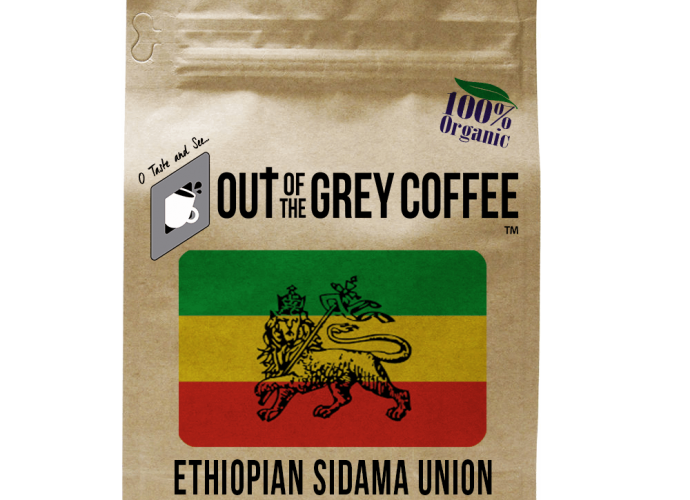 Out of the Grey – Sidama Union Heirloom: Opening the package. 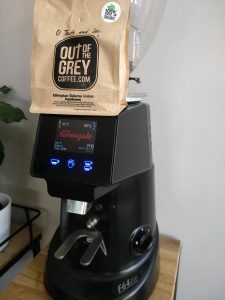 The Out of the Grey coffee comes in it’s characteristic beige package with the logo on the front. There is a sticker that guarantees a 100% organic coffee and it has a ziplock and degassing valve. When opening the package the roast looks beautiful; even coloured and the heirloom beans all looks the same size. I could not find any defects in the bag, not even a shell or something. The aroma coming out of the bag is sweet and chocolate like but also has a fresh floral scent to it. When biting down on a bean I notice that its crunchy and has a dark tea like aspect to it. A soft bitterness comes up but remains mild even on the aftertaste. I start up my Fiorenzato F64 EVO to do some grinding! The ground coffee has nice aroma’s of cookies and sugared tea. I can’t wait to brew an espresso! 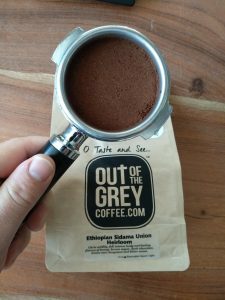 Out of the Grey – Sidama Union Heirloom: The tasting. 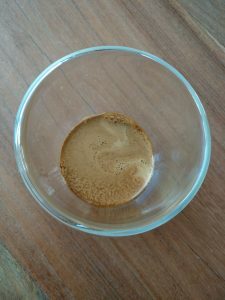 I reviewed the coffee on my ECM Giotto and started with 16 grams of coffee and 30gr out. I noticed that when I used more coffee, the flavours became more balanced. Under 18 grams of coffee, the sour notes would be more dominant. The balance in this coffee can be found between 18 grams and 19.5 grams of coffee. 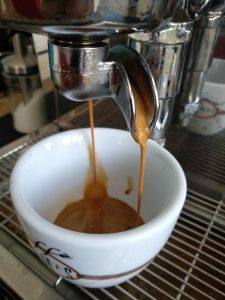 If you find the coffee a little too sour to your liking, I suggest to skip all the ‘espresso rules’ you know and brew a couple of seconds longer. That way the bitters will be more prominent in your cup. Try extending the brewing with 3 seconds to start with for example. The coffee has all the brown colours you will want to see when brewing an espresso. From dark brown all the way to light beige, creating a layer of tiger fur in a small espresso cup. The aroma of the coffee takes over the room and makes me think of white blossom, bergamot and soft mandarin. The mandarin is exactly what I get in my cup as I taste the coffee. It is not the exact flavour of a mandarin, it is more like the mouthfeel of a unripe sour-ish mandarin. I slurp in some oxygen and notice the floral note of bergamot that comes forth and gives this coffee its freshness that I like so much in an Ethiopian coffee. 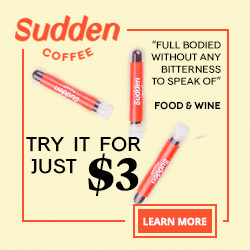 My mouth reacts to the coffee and turns it into a smooth, buttery coffee that has a bright acidity on my tongue at first. As the coffee swirls through my mouth, the light flavours make way for flavours of honey and cookies. Right after that, they change into a dark chocolate bitter that takes over in the back of my mouth. The flavours balance each other out and create a smooth perfect finish on this coffee. The aftertaste is that of a mild caramel/chocolate with a nice citric acidity undertone that lingers on and on. Out of the Grey – Sidama Union Heirloom: The verdict. I am a huge fan of Ethiopian coffees and see. all too often, how roasters mess up their potential by roasting it too dark. 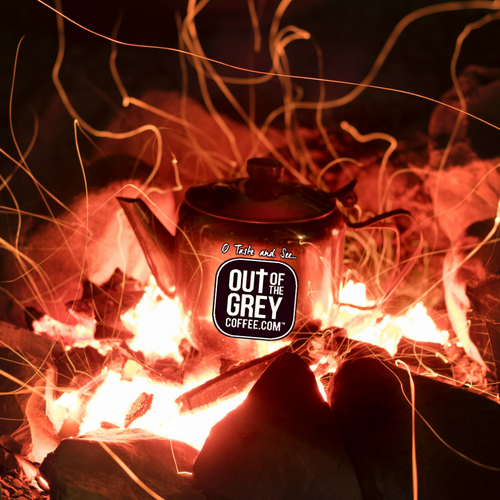 This Sidama Union Heirloom by Out of the Grey was perfectly roasted and resulted in a balanced cup of coffee. The floral notes, sour-ish undertone and citric acidity are great. When these aspects mingle with the honey, cookies and dark chocolate, it creates a balanced cup of coffee that is just great! I also loved how this coffee felt smooth and buttery and how the aftertaste lingered on and on. 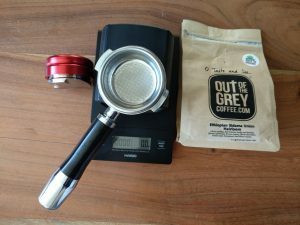 One of the better coffees from Out of the Grey if I may say so! Next Post: Review: Out of the Grey – Amedeo.